It's easy to get swallowed up by credit card debt – all it takes is one late payment for it to start adding up. And if you carry a balance on your credit card, it may seem like a never-ending battle to keep your payments low. That's why low APR credit cards are handy – they allow you to put more money in your pocket instead of paying off mounts of interest. Something important to note is your APR is greatly affected by your credit score. Now, we know we can't really control the prime rate, but what we can hold an influence over is our credit score. And if you have poor credit, it's safe to assume that you'll be paying higher than average interest rates, making it that much harder to stay on top of your credit card debt. If you're looking to improve your credit score, you might have to bite the bullet and opt for a secured credit card to get you started. There are 3 different kinds of credit card APR to keep in mind. Purchase APR applies to any purchases you make with the card. If you don't pay off your balance in full by the time your payment is due, this is the interest rate that will apply to your outstanding balance. Many credit cards will come with an introductory purchase APR, usually 0% for 12 months or more, depending on the card. They can be a great way to get an interest free loan – just be sure to pay everything off by the end of the promotion period. If you need to use your credit card to get some cash from an ATM, the cash advance interest rate applies. Unlike the purchase rate, this one applies as soon as you get your cash. So, if you do need to access some quick cash, be sure to pay it off as soon as possible. This is also the highest average interest rate among the 3 and rarely varies depending on your credit score. Everyone gets the same (super high) rate. The balance transfer APR is when you transfer an existing credit card balance over to a new credit card. 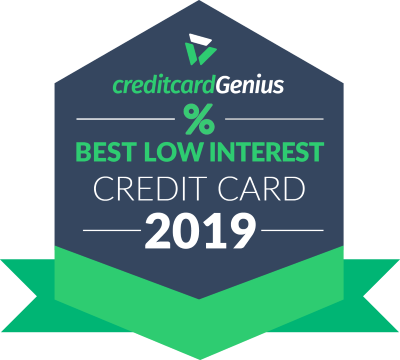 Some credit cards will have balance transfer promos where you can take advantage of lower than average APR rates and save on interest in the long run. There are many pros to having a low APR credit card in your wallet. If you're planning on making a large purchase on your credit card, like a TV or a piece of furniture, having a low APR credit card can take off some of the stress you feel when it comes time to start paying off your large purchase. You'll have peace of mind knowing that, even if you can't pay it all off right away, you won't get swept up and carried away by crazy interest. When paired with another credit card, low APR credit cards can be useful for balance transfers. Balance transfers are when you carry over the balance of an existing credit card, most likely one with higher interest, to one with lower interest. This can help lower huge interest payments you might currently be making. How would you like to pay 29% on your balances? I know I wouldn't! Basically, to calculate how much interest you'll be paying on your credit card balance each day, all you have to do is take your current APR rate and divide it by 365. Then, take that number and multiply it by your current balance. That's how much interest will be added to your balance the next day, and every day after that. Or, to make things easier, you can use our handy-dandy interest calculator widget. Simply enter your current APR rate and your current balance, and you're set to go. You can even see what your credit card balance will look like if you switch to a lower APR credit card. Have your interest payments been piling up? Perhaps it's time to think about getting a low APR credit card – it will help you save loads in interest.